For the past three years, about 20 people from the government IT community have taken a week out of their lives to give back. 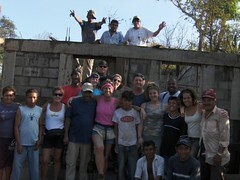 They travel to a small town in Nicaragua to help build a town. It is part of a program called Bridges to Community and it is led by Leslie Barry, vice president of government affairs and business development for GTSI. There is still time to attend the fundraiser on Thursday. Get information here. I’ve posted one photo here, but… you can see a slideshow of photos from the 2008 trip. You can also read more about her 2007 trip from FCW, which features a conversation I had with Barry — complete with photos. FCW also spoke to Barry in 2006.